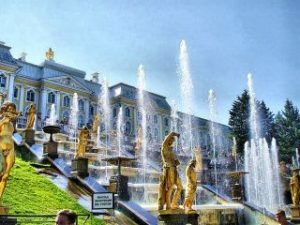 Peterhof, that is often called “Russian Versailles” or “The Capital of Fountains”, is probably, the most famous and spectacular Imperial estate in St. Petersburg, a town of parks, palaces, and fountains. It is located on the coast of the Gulf of Finland. Peterhof was the favourite summer estate of Peter the Great and for a long period of time it was the official residence of Romanovs dynasty. The idea of creating the whole architectural ensemble, the basic planning of design, the projects of decorations art belongs personally to Peter the Great. The construction of the new Summer residence had started in 1714, and its grand opening was held on 15 August 1723. The Grand Palace, with it’s fascinating and magnificient interiors, stays on the top of a high seashore, overlooking the Lower Park. The Lower Park is situated between the Grand Palace and the coast of the Gulf of Finland. It is famous for the world’s largest system of fountains, spread under the parks lands. The unique fountain system of the park was designed in the 18th century and doesn’t require the use of any pumps to operate the fountains. There are three major cascades and over 140 fountains in the park. The most impressive is the Grand Cascade, located directly below the Grand Palace and featuring an impressive golden statue of Samson grasping the mighty jaws of the lion.